Just as it is only the small part of an iceberg which shows above water because it is upheld by the bold of the iceberg hidden beneath the waves, so the recent spate of school-shootings bursting out oven the last few years in the USA is only the manifestation of deep and broad problems in modern life, so hidden from view that few people even imagine them any longer to be problems. 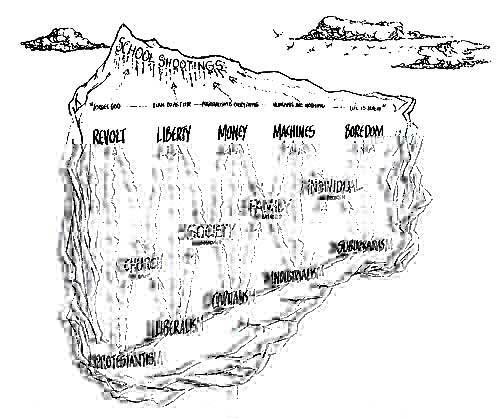 Like many such diagrams, the iceberg opposite has to be over-simplified, but it does present an inter-connection of problems found all over the world, merely farthest advanced, now and for the foreseeable future, in the USA. This is because no other country was bunt quite like the USA upon Protestant foundations. PROTESTANTISM smashes in men’s minds the true God by denying major truths, like the dogma of the Real Presence, which, God has revealed to be true. Decent Protestants are only unconscious, as opposed to conscious, liars. The lies still wreak the same havoc in the souls of men. Originally brought oven the ocean by heretical Englishmen, Protestantism, in particular Puritanism, lies at the heart of most deep ills in the USA today. Catholics can only disbelieve this by more or less sharing in the Protestants’ mushy idea of God. CAPITALISM is merely this liberty applied to economics or to things material, because in a world where spiritual truth has no longer any meaning outside of my consent, things spiritual are of no significance, and the free pursuit of things material becomes all that matters. Henceforth society only exists to protect my individual life and liberty to pursue happiness, i.e. money. It will be a new kind of society. I will believe it is the greatest society the world has ever known. INDUSTRIALISM follows naturally upon the liberated pursuit of money and things material. Freed up from any further spiritual wastage or hindrance, all human intelligence and energy can now be devoted to improving man’s life by an ever?increasing mastery of matter, through science, technology and industry. By machines the highest standard of living for the largest number of people ever will be created. If so?called “nature” sutlers from father being pulled out of the family for instance, or from men being torn off the land, that is a small price to pay for progress! Besides SUBURBANISM, the resulting environment made possible only by machines, notably, the motor?car, may be artificial, but it is obviously the environment being democratically chosen by the ever?increasing majority of people world?wide. It offers unprecedented ease and comfort. Adolescents may land it boring to begin with, but most of them grow up to appreciate its advantages. It is a shame if more and more of them are killing themselves or one another. We smother them in material goods. Why are they suffocating?